After a cold and wet day at my daughter’s school Fall fair, it’s hard to believe we were playing in the ocean just last weekend with 80 degree temperatures. Anyway, I thought while we were on vacation it would be a great time to work on our own holiday card pictures but man, is it hard!! 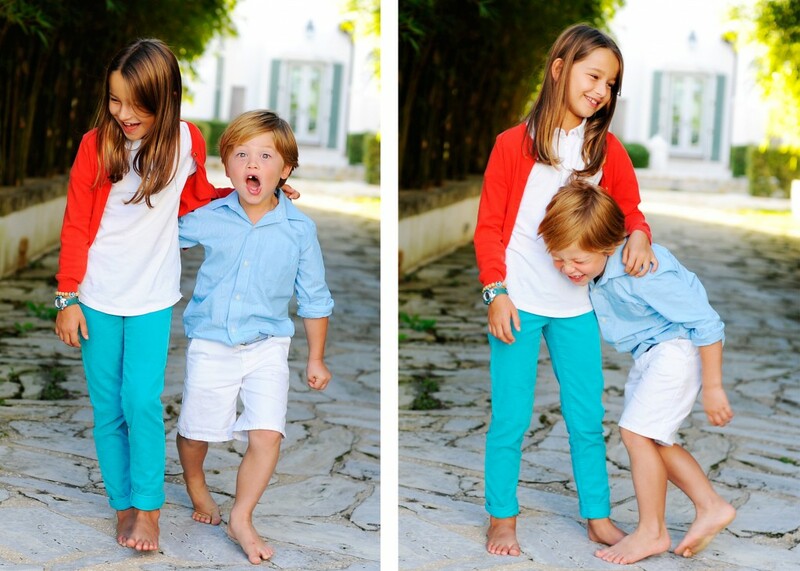 Now I see why people pay me to do their family photos. 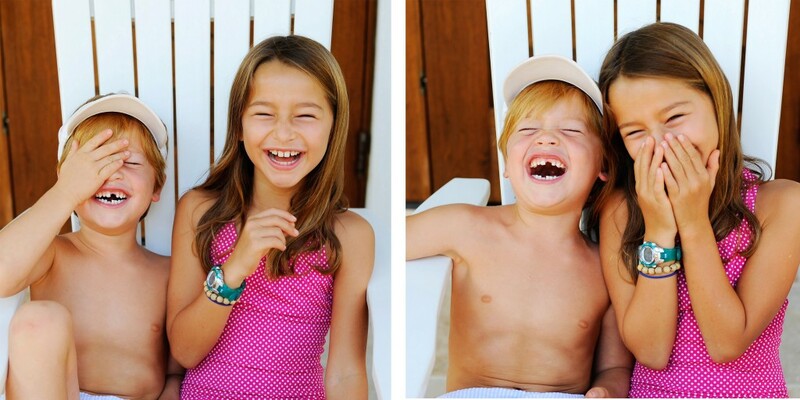 The good thing about my kids is that they are pretty easy to make laugh. You say “toot” and they are in tears from laughing so hard, which you would think makes it easy, but it can actually make it a little tough too. I mean seriously, where are their eyes? Okay, so here’s our attempt at a holiday card…. Well, I guess it could be worse. Good thing for me it’s only October!! So I’m sorry I’ve been so MIA but this is my crazy busy season, so finding time to post is not easy. But, this was a recipe I had to share ,and it’s perfect for a cold and rainy day like today. So when I was growing up, my family and I would go to Piccadilly (yep, showing my red side), but I remember going there and getting their Salisbury steak, green beans, mashed potatoes and a piece of chocolate cake. Mmmm, it was so dang good. Dang!! I know…it just felt appropriate. Anyway, I can’t say I’ve had Salisbury steak in quite some time. Honestly, probably not since my Piccadilly days 30 years ago (wow, 30 years ago??) but this recipe brought back memories for sure! The picture of the meal at the bottom does not do it justice at all, but it is REALLY good and I can’t wait to make it again!! And it goes really well with the cauliflower mash. Just like Piccadilly, but not. Preheat oven to 350. 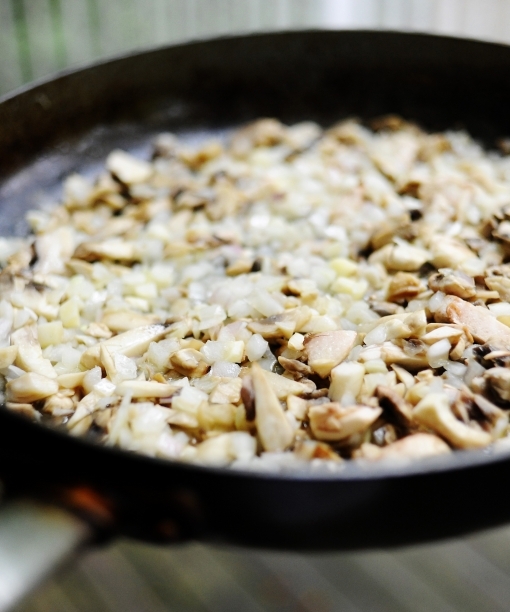 Then, start by chopping the onion and mushrooms. Next add butter to a hot pan and saute the veggies until soft. Next, in a medium bowl, put meat, egg, 1/2 tsp pepper, almond flour, salt, mustard and onion powder and mash together and make flat patties about the size of your fist. 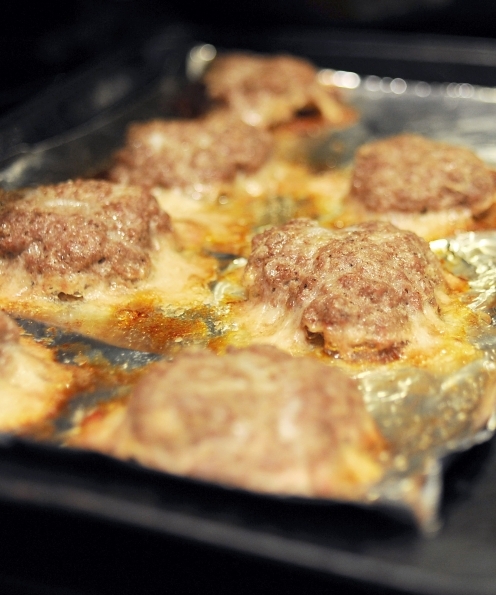 Then, on a cookie sheet lined with foil, place the patties there and cook for 25 minutes. While the meat is cooking, make your”gravy” by getting out a medium pot, and add your beef broth, arrowroot powder and the other 1/2 tsp pepper, your sauteed veggies, coconut milk and some salt to taste and cook on low for 10 minutes. Once the meat is done cooking, it will NOT look pretty but don’t worry, it will taste amazing!! 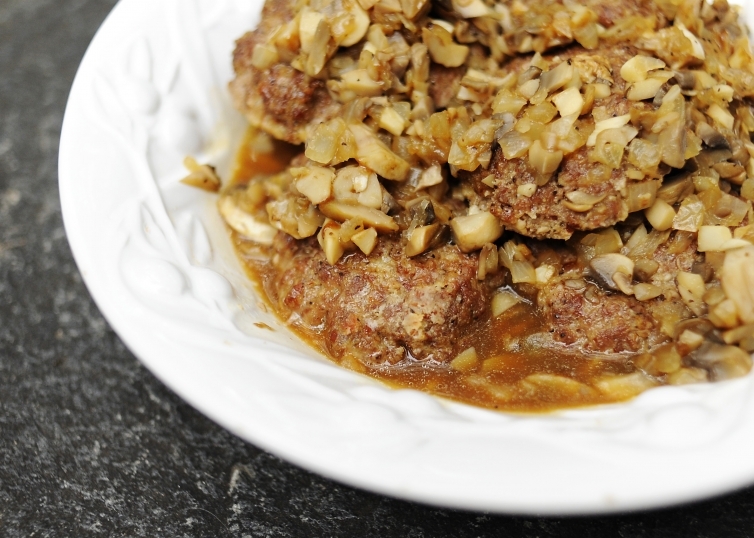 Now, lay the patties out flat on a large deep pan or bowl, add the “gravy” and enjoy. Next time I will double this recipe for sure!! It makes for great leftovers! This recipe is a rendition that I originally got from Domestic Man’s web site. His site is great if you love your meat and his recipes are super tasty! Thanks Domestic Man for the travel back in time!